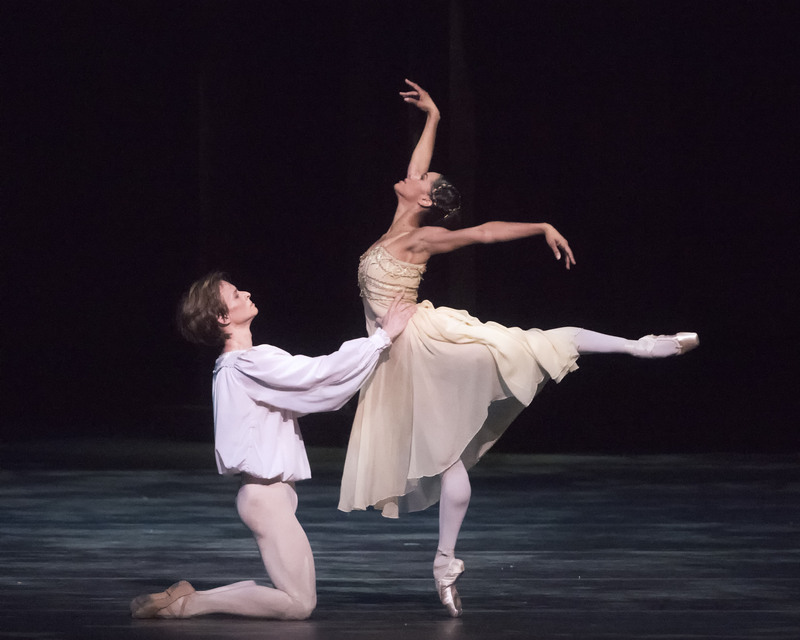 Daniil Simkin made his debut as Romeo on Saturday afternoon, in Kenneth MacMillan's immortal rendering of the tale of warring tribes. He was teamed with Misty Copeland, in her third outing as Juliet. 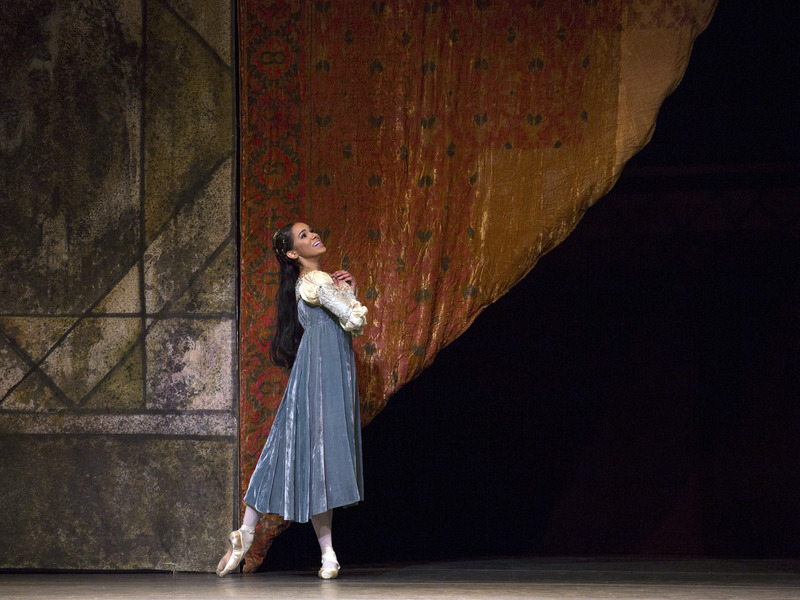 The pair brought youthful ardor and recklessness to their roles - and attracted an enormous fan base that encompassed both ballet veterans and first-timers in a diversity of ages and backgrounds rarely seen at New York's Metropolitan Opera House. The theme of senseless violence, stemming from feuds that no one remembers the cause of, resonates today. Bodies pile up, weeping women litter the streets. The terror spares no social caste. When the curtain falls on the dead bodies of Romeo and Juliet, MacMillan omits Shakespeare's reconciliation between the Montagues and Capulets. The magnitude of the tragedy is thus amplified, as no good appears to come out of the double suicide. As young lovers defying authority, Simkin and Copeland flaunt heart-stopping physicality in the balcony, bedroom and crypt scenes - though not at the expense of lyrical, fluid technique. In the balcony scene, Simkin's poetically expansive renversés, pirouettes with outflung leg, and rocket-fueled manège trace the rapid deepening of an infatuation. And when he receives Juliet's letter instructing him to show up for their secret wedding, the unrestrained joy which sends him leaping seemed to ripple through the opera house. Avenging the death of Mercutio (Craig Salstein, in a tour de force), Simkin takes on the formidable, ferocious Roman Zhurbin in the role of Tybalt. Simkin slays Zhurbin in a white-hot fury, their swordfight utterly convincing though Simkin is smaller and slighter of build. Simkin has not often distinguished himself as a partner of ballerinas. This partnership, however, is nothing short of spectacular - all the way through the hair-raising Act III crypt scene, where the distraught Romeo flings Juliet's limp, unresponsive body every which way. From our first glimpse of Copeland in Juliet's playroom, pestering her long-suffering Nurse (the marvelous Nancy Raffa), we know this Juliet must have been hell on wheels as a toddler. But she is suddenly disoriented when her parents show up with the man they intend her to marry. Unlike some Juliets, Copeland doesn't come across in this moment as vulnerable or shy, just astonished. She doesn't know what to make of the handsome, noble Paris (the sterling Sterling Baca), and she doesn't immediately acquiesce to her parents' plan. Her manner indicates that she is going to have to think about it. When she does finally dance with Paris at her parents' ball, her movement is delicate, liquid but precise. This is no dewy-eyed reading of Juliet: as each exquisite shape unfurls, Copeland conveys a growing understanding of what society expects of her, leading up to her masterful phrasing in the mandolin dance. Copeland's encounters with Simkin, in contrast, are underscored by risk-taking. The mere sight of Copeland flying down the steps from her balcony to meet him in the garden at midnight was thrilling - though it's a miracle she didn't trip in the abysmal lighting. And when she dashes off to seek counsel from the friar, that glorious headlong canter conveys equal parts exultation and stubborn determination. This strong-minded, high-energy Juliet also shows explosive flashes of anger. Confrontations - with her parents, and with Paris who pretty much assaults her in her bedroom, in front of her parents - are riveting. Her furious wrestling with Simkin, when he tries to tear himself away at dawn before he is discovered in her bedroom, is charged with eroticism. The one moment when Copeland takes the drama over the top is in the crypt, when she awakens from her drug-induced sleep and discovers Romeo's corpse. She lets out a soundless cry, her mouth agape. Up to that point, her facial expressions had been entirely naturalistic; she had conveyed her emotions through her eyes and through movement, through eloquent inclinations of her neck, expressive port de bras, the stiffening and relaxing of her spine, the rooting of her feet into the ground, and her delicate use of quarter- and demi-pointe. She should trust these ample gifts. Over-the-top drama is rightly the province of the unhinged Lady Capulet - a very fine Stephanie Williams at Saturday's matinee. While grieving the murder of her nephew (and secret lover) Tybalt, she must contemplate the apparent suicide of her daughter. Williams tries to take this in, paralyzed in a corner of Juliet's bedroom, while her husband is trying to revive Juliet. This and other subtle yet crucial moments in MacMillan's spellbinding choreography were barely readable at this performance, for someone in the lighting booth must have fallen asleep at the switch after they dimmed the chandeliers at the glittering ball chez Capulet. The quattrocento never looked so gloomy. Nothing, however, could dim the bright red shock of curls atop the heads of the three improbably happy harlots (who get an indecent amount of airtime.) While it may be sacrilege to tinker with MacMillan's choreographic portrayal of the streetwalkers, could we at least give them a make-over? Why do harlots always have to be curly-mopped redheads? Why do harlots always have to be women, for that matter? Men have distinguished themselves in female roles in ballet since time immemorial, and no company today has a deeper bench of accomplished male actor-dancers than American Ballet Theatre.